Yo, Lear! Brush Up Your Shakespeare! 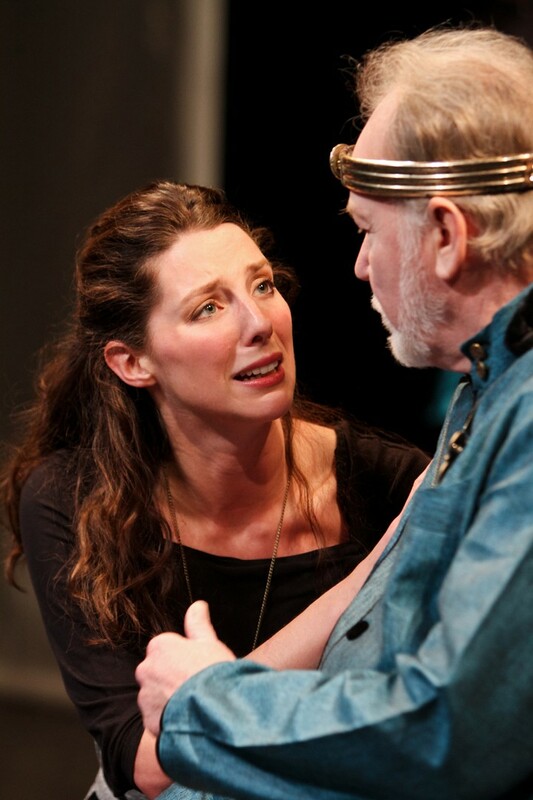 Seattle Shakespeare Company premiered its "King Lear" last night. Runs through May 17th. Oh dear, hasn't any cast member watched "House of Cards"? You don't need to carry on like a banshee to convey emotion. How sharper than a serpent's tooth, etc., to let Shakespeare's words speak for themselves. On the other hand, the lack of pageantry (no-decor sets, plain costumes) erases most of Shakespeare's (useful) class distinctions. Lear's bizarre behavior (Alzheimer's? ), starting with the opening scene, is supposed to be the first step toward his tragic end, but we see no aspect of his character to make us care about his fate. One nice touch in the production: the decent, long-suffering Duke of Kent becomes the Duchess of Kent, ably played by Amy Thone. Elinor Gunn as Cordelia, Dan Kremer as Lear. Photo by John Ulman. This page contains a single entry by Cornichon published on April 26, 2014 10:00 AM. The new Nespresso: "Centrifusion" reigns was the previous entry in this blog. Eating with a Grown-up Urbanspoon is the next entry in this blog.